User Experience Design: UX, XD or "Customer Experience", is the process of enhancing the customer's satisfaction by improving the usability, accessibility, and pleasure provided in the interaction between the user and your website. Depending on how your website or software is designed, the user experience can range from delightful to downright frustrating. UX design isn’t limited to the digital space, either. Anything that can be experienced can be designed, from the packaging of a toy to the dashboard of your car. However, this is usually how your customer experiences your brand when visiting your website and trying to interact with your company online. Having a professional evaluation of the User’s Experience is imperative for improving conversion rates and increasing sales. Heather Neff has over 19 years of marketing and user interface design experience and can evaluate your website for best practices and user-friendliness. She can determine the edits that need to be performed to improve the customer's experience (think of it as a website audit). People create thoughts and emotions based on their experiences. All it takes is one bad experience to have someone decide not to call you back, or leave a permanent, scathing review on the internet. Google now actually uses your mobile site speed as their number one determiner of a quality site, as it all about how long people have to wait to see your site load on their phones. In order for humans to make the most out of complex systems like websites, UX designers had to start thinking about how people interact with them. We look for ways to make those interactions as intuitive and straightforward as possible. Anywhere decisions are being made about your products or services, we are the voice of your customers. It’s our duty to advocate for them, and we need to be able to view the website through their eyes to do so. What are their pain points? How do you offer to solve their issues? What are their goals? What do they want? Why are you different? Does this site load fast enough?! Heather will become a first-time customer and start by searching for your site... She offers suggestions and advice on how to rank better in Google, how you can serve your customers better, and how to improve your website's overall experience. Her job is to clarify your services, create consistent marketing messages, review your site speed, mobile site, SEO/rankings, branding, and call to actions. You want to have a professional, easy to use site that makes people feel like their needs are not only met, but acceded! We make things as easy as possible for them to do business with you. We usually come up with a few questions that your site does not answer or explain well. We evaluate best practices from simple forms to complex interactions. Using years of user interface design experience, Heather brings expertise on how to reassure customers, and to guide them in the right direction. Good UX also equals better SEO. Once she has done a comprehensive user experience analysis - She will create a detailed list of suggested website edits for your company. We will work with you to determine your marketing goals and how to reach those goals with changes to your site. Is it brand awareness? Converting visitors to purchase an item? Get them to signup for a workshop? Who is your target audience? After we determine the marketing goals, and outline who your ideal customers are, we will review your site with these goals in mind. We will review both desktop and mobile versions as if we were a brand new customer. The entire experience we have interacting with your company will be analyzed. This will include navigation, current customer retentions (such as newsletter popups), logo/branding design (all images / colors / fonts), SEO and marketing messages. We will put together all our suggested edits into a Google doc so that these edits can be sent to your web development company. All this is done hourly, and depends on how complex your current site is, and how many marketing channels you currently utilize. We will even review your social media for brand consistency and improvements that could be made. Our goal is to have your customers interact and do business with your company, and come away with a very positive feeling. Optimizing for mobile is less about content changes as it is about improving the overall experience for users visiting the website using a smaller screen. Google takes into account if your site is mobile friendly - and if it’s not, you are penalized with a lower ranking. Most of our clients have over 60% of their traffic coming from mobile and tablets, making it actually the number one thing you should do, review and make sure your mobile site experience is even better than the desktop! Google announced in 2018 that it is starting to index your mobile site as the main site that is ranked in Google as well. We make sure when your phone number or email address is tapped on the mobile screen, it launches to make a phone call or to send you an email. You would be surprised how many mobile sites aren’t formatted correctly to help your customers contact your business. How fast your mobile site loads is now the most crucial thing you should be focusing on. We will also test how long it takes for your site load on both a mobile device and a desktop, and offer suggestions for speeding everything up. The industry standard is to have your desktop load in 4 seconds or less. We also recommend aiming for 6-8 seconds on mobile. We will review your Google analytics and work with your team to explain our suggestions and determine the best way to execute changes to your website. Benchmarking your current traffic and drop-off points help us to determine which edits should be made and later, to see if the changes are working out as planned. Don't have a Google analytics account? We can help set this code up in the backend of your website. User experience and SEO are tied together now - and changing your website to satisfy the customer's needs can lead to higher rankings in Google. The better overall experience a customer has, the longer they stay and interact with your site, Google records this - and notes sites that make customers happy. Site speed, time spent on the site, metadata within your headtags - all reflects back on how Google ranks your website. We will also review your metadata and rewrite keyword rich, eye-catching and convincing ad copy for your title tags and descriptions to make customers click. We also take into account new regulations from Google for the Americans with Disabilities Act (ADA) for web accessibility. We will help make you aware of any issues and give you the advice needed to be compliant for people who visit your website who are hard of hearing, have color blindness or poor eyesight. For example, the images on your website must have an alternative text or "alt tag" associated with them in the event they do not display on a device or the person is unable to see the image. The alt tag description will then clearly describe what that image is. We also try to combine alt tags with SEO, and make sure the images are also named correctly for Google, and will load incredibly fast. Google will take into account if you are ADA compliant which will affect your ranking within search engines. Using standard browser fonts such as verdana allows you to bypass the time it takes for each browser to download selected fonts to each persons phone or desktop when loading the site. Each font you are trying to install weighs down your load time. It is advised to use the same font family for each H1, H2, H3 and body tags as a way to reduce this load time. Standard web fonts include Arial, Times, Courier, Helvetica, Georgia, Garamond, Trebuchet MS and Verdana. For every typeface family used in your website, it requires the servers to download each font family by the customer’s computer before they can see that text. “Only including the Regular and Bold styles, plus their italic counterparts, can amount to 500k or more of data.” says Google. Without knowing who else offers similar services, and what they do for their customers - you can not stand out from the crowd. We will research your competitors and review and contrast your site and services with theirs. We will analyze your site's ranking vs. their site, and research and determine what you are doing right, what you are doing wrong, and how to improve things. Your brand needs to be superior in every way, and knowing who you are up against is part of the UX audit. Usually, there are graphical and branding issues, such as low resolution imagery. Sometimes your images can be too big or the wrong format, and we will recommend that we reduce or change the files for improved load times. Images usually account for more than 65% of the kilobytes needed to load an average web page. Once we determine which images that need improvement, we can also design and properly export and rename these graphical elements for you. These can include icons, photos, logos, favicons, and infographics. We highly suggest making simple logos into .svg or 'scalable vector graphics' for high definition display across all devices. Sometimes we might even convert your logo into .svg code for the fastest load speed! We will go over the suggested changes either in person or over the phone and you can decide if you would like me to create these updated files. Working with Neff Creative was a very great experience! I was very impressed by how knowledgeable Heather was regarding my website for designing the best experience my customers could have. If your current website needs a lot of work, we can also design a new custom user interface. Custom user interfaces will be laid out to perfection using Adobe XD. All Interfaces will be designed in high definition. We will also create a CSS style guide for you development team. All image files will utilize scalable vector graphics files (.svg). In the case of logos or icons that are developed with simple enough lines, we will export .svg code as well and test your designs with interactive slides. Thank you! I look forward to working with you soon! A customer journey map is a graphical interpretation of the user's experience and their relationship and touchpoints with your company. The user experience is laid-out from the customer’s perspective, and shows in a visual way on a timeline the interactions and emotions the customer has. This journey map focuses on building long term relationships with your customers by seeing where your company doesn't support or respond to your customers needs and wants. The idea is to create a info-graphic on a timeline to show you where the customers come in, what they do, how they feel and how they interact with your sales staff and website. This utilizes Google Analytic drop off points, customer interviews, sales team responses, social media interactions (comments and reviews) and where there is room for improvement for every channel you market in. All businesses have goals and using a custom made customer journey map as a supporting component of an user experience strategy keeps customers at the forefront when making marketing decisions. They can be used to show you amazing opportunities for building a better experience for your customers. Events: all your touchpoints - call to actions, drip campaign responses, newsletters, phone calls, emails etc. In some cases, you can also develop empathy for your customers by inserting yourself in their lives for several days, weeks, or months. By tracing the users pathway from start to finish, and even post sale follow-up - a user experience journey map is a great way to layout the lifecycle of your customer and where your next opportunities and marketing efforts should be focused on. Some of the best marketing comes from simply reviewing what you could be doing to retain and attract your ideal clients. Journey maps don’t always become a beautiful design as sometimes they begin and end as quick sketches on a whiteboard for your team to review. But most of the time, when you go through the activities to arrive at a solid customer journey map, you want to polish it, leverage it in your work and share it with colleagues across the organization. As a visual graphic designer, I can design a final customer journey map to share with your colleagues and to brain storm solutions and marketing campaigns to engage and delight your current and past customers. Actionable Journey maps focusing on your customers help your business to also stand out from its competitors by offering value-added services that will heighten customer satisfaction which in turn makes them loyal customers and will generate more customer referrals. Let me help you design a custom journey map which will guide your company to create a delightful experience for every customer. Visualize behavior – Understand what users want, care about and do on your site by visually representing their clicks, taps and scrolling behavior – which are the strongest indicators of visitor motivation and desire. 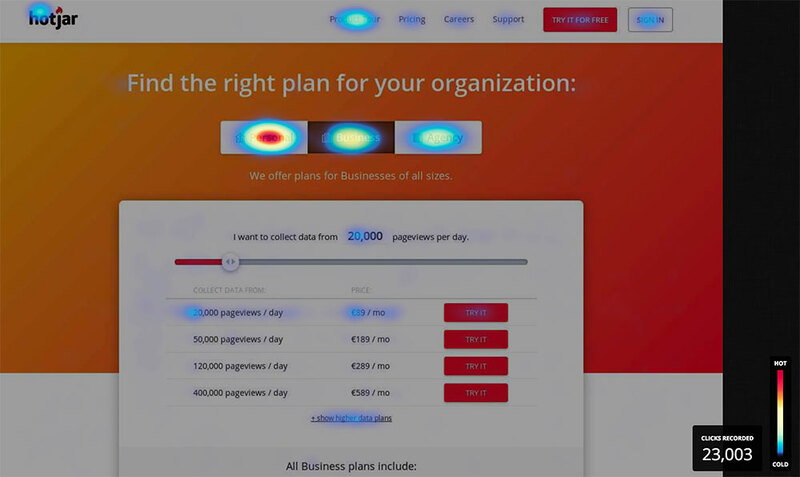 We can review your heatmaps for best performance. We can also set up sales funnels, track conversion rates, and more.